Yes, of course, what did you think? We counted eight spoonfuls of flour into a bowl, then someone cracked in the egg, another poured in the milk, and another held the mixer and mixed until the batter was smooth and arms ached. We put cups full of batter into a sizzling pan and enjoyed the gorgeous individual patterns that appeared. The pancakes were turned, not tossed! 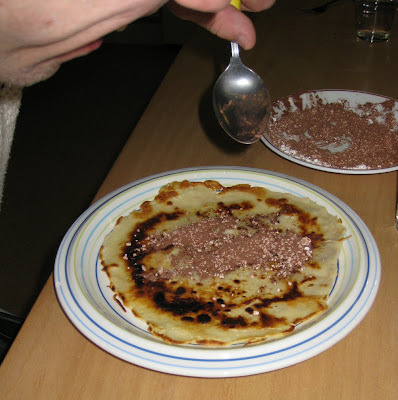 We mixed icing sugar with cocoa powder, that in turn was spread on the hot pancakes. Still remaining traditionally very British, I ate mine just with lemon. The Germans eat doughnuts on Shrove Tuesday, and on just about every other day in the month before, but in my evening Workers Group there is a slight English influence and we usually make and eat pancakes. The cleaner followed her nose and came in to join us.